When you hear ‘safari’, you might think of the Masai Mara in Kenya, the Serengeti National Park in Tanzania or the Kruger National Park in South Africa. Canada is a destination that often gets overlooked. But, considering that Canada is home to some of the best scenery, road trips and varied wildlife in the world, we think Canada is the best safari location that you’ve probably never considered! There’s no doubt that Icefields Parkway in Alberta and the Cabot Trail in Nova Scotia are two of the most popular places to go on your own safari, but there are lots of other intimate and authentic safari experiences to try in lesser-known areas of Canada. Click on our map to find out the locations and read below for more information about what you can see on each route. Travel writer and international television host Robin Esrock is the bestselling author of The Great Canadian Bucket List: Once-in-a-Lifetime Travel Experiences. He has visited all of the below routes and tells us that they are great for spotting wildlife. 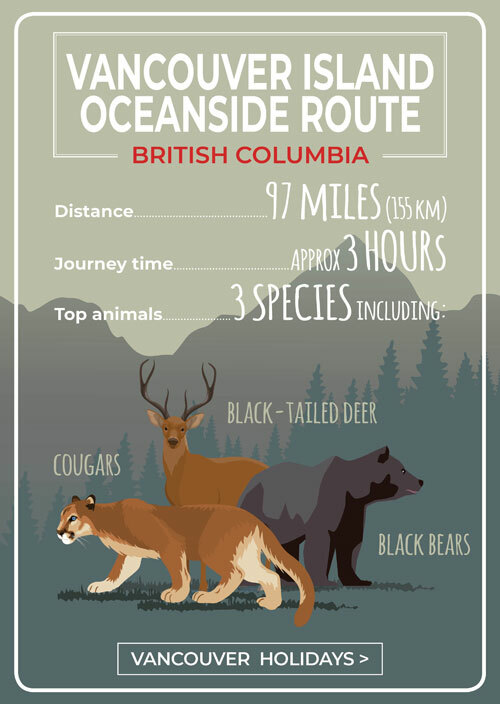 A great destination for wildlife watching is along the Vancouver Island Oceanside Route, which runs from Nanaimo (where the ferry from Vancouver arrives into) up to Campbell River. If you are using our services for car hire in Vancouver, then driving along this route is a must as the Oceanside Route of Highway 19A is a quiet, nature-focused journey. It boasts a unique landscape: one minute you’ll be travelling through the valleys and beside the ocean and the next you’ll be heading over tall peaks. The road hugs the coast and, as a result, there are plenty of beachfront towns along the road, such as the picturesque town of Nanaimo. Although you are still close to some urban areas, there’s lots of Vancouver wildlife for you to see. According to Discover Vancouver Island, there are more than 7,000 black bears on Vancouver Island, making the area one of the most densely populated places in the world for this type of bear. The black-tailed deer is another common sighting along the route and if you’re really lucky, you may even get a sighting of a cougar, grey wolf, or grizzly bear. One of the most iconic driving routes not only in Canada but the world is the Icefields Parkway, as you journey through the spectacular Banff National Park and Jasper National Park. Rated as one of the top drives in the world, the trip takes in the likes of Lake Louise, the Rocky Mountains and the Columbia Icefield. It is also a great place to go on a safari in Canada and seeing wildlife up close and personal is often a highlight of a visit to the Canadian Rockies. 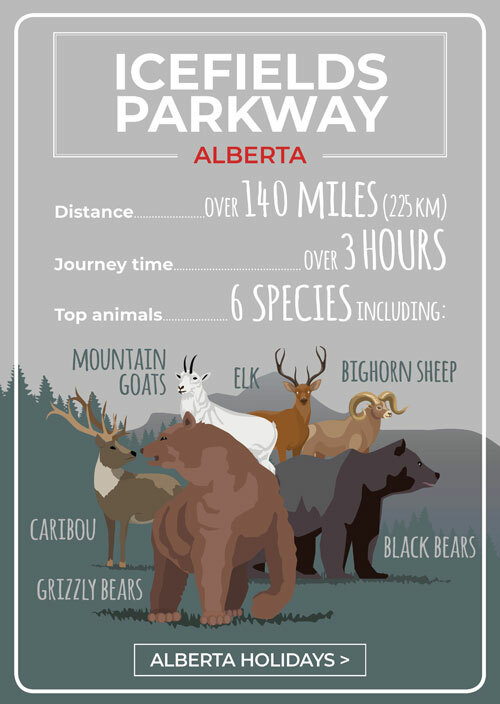 With over 53 species of mammals and more than 260 species of birds in the national parks, you are very likely to see animals as you travel down this route. Mountain goats, caribou, moose, black bears and grizzly bears are all commonly seen along the spectacular route so keep your eyes open! The Highway 60 Corridor passes through the southern section of Algonquin Provincial Park in Ontario and is open year-round. It is the most accessible area of the park and goes past a number of attractions and picnic areas, just a few hours north of Toronto. 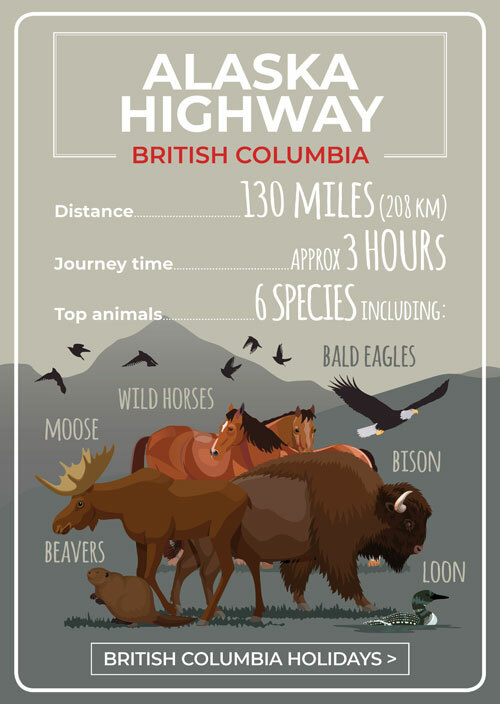 The highway is also a well-known route for spotting wildlife, which should come as little surprise as Algonquin is home to 55 mammal species, 32 kinds of reptiles and amphibians, and more than 140 species of breeding birds. 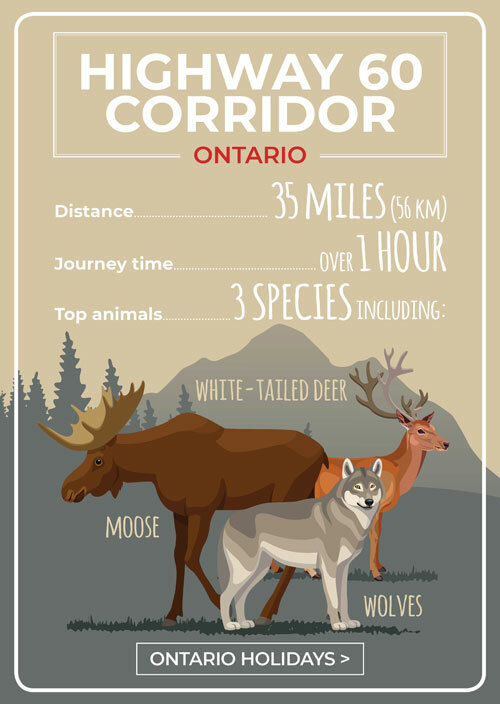 Moose, deer and wolves can all be seen from the Highway 60 Corridor. You should aim to go in the early morning to see the birds and mammals. Plus, by heading out early, you will have the entire route to yourself with very few people about. When looking for wildlife, you should look for low-lying, wet areas like ponds or bogs as these are often the preferred habitat for many wildlife species and provide breaks in the thick forest. To really see the wilderness of British Columbia’s north you should travel along the historic Alaska Highway. The highway has been described as the largest and most difficult construction project since the creation of the Panama Canal. The entire Alaska Highway stretches from Dawson Creek in British Columbia to Delta Junction in Alaska (over 1,400 miles), but during the Canadian portion of the route, you will experience some spectacular scenery of the northern Canadian Rockies. En route to Muncho Lake, you can stop off at Stone Mountain Provincial Park for incredible views and amazing wildlife viewing opportunities. So, keep your eyes peeled and take your binoculars to see if you can get a glimpse of moose, bison, eagles and other bird species. Highway 2 is a provincial highway in Saskatchewan that runs from Regina to Waskesiu and cuts through an area rich in history. If you’re driving along this route you should look to visit the Big Muddy Badlands, an area famed for being used by outlaws and rum runners to hide out during the 19th and early 20th century. Along the route, you will wind up and down hills created by glacier movement and will get to see lots of wildlife. 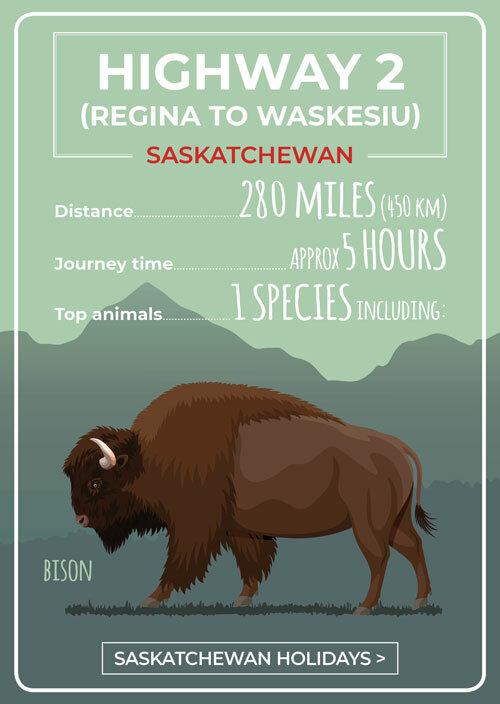 As you approach Waskesiu, you will be entering Saskatchewan’s bison country. The bison here roam free to the west of Prince Albert National Park and it is now one of the few areas in the world where you can see plains bison within their historical range. After almost becoming extinct, the bison population has improved with around 1,000 of them now living peacefully in the area. 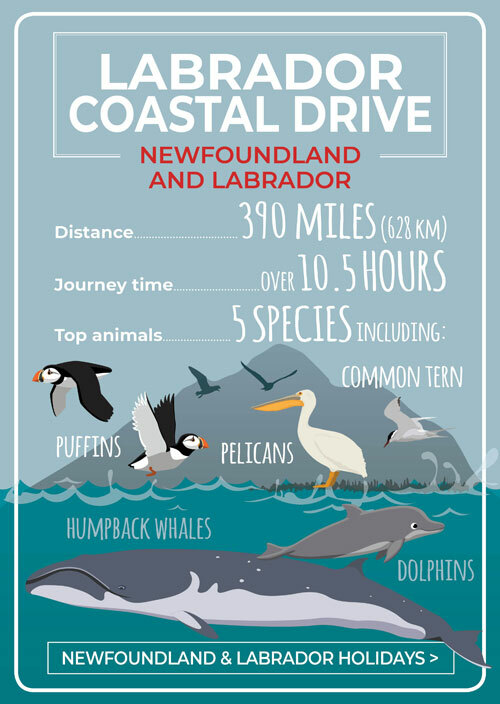 This popular driving route goes through a rugged and pristine region of Labrador along the edge of the North Atlantic Ocean. By driving along this route, you will be retracing the footsteps of ancient mariners and the Native Americans before them. Point Amour Lighthouse is the perfect viewpoint to see spectacular icebergs. The Red Bay National Historic Site of Canada is where you can hear stories and view artefacts from a Basque Whaling Station. The Battle Harbour is a charming restored fishing village. With its picturesque coastline and stunning highlands, the Cabot Trail in Nova Scotia is now regarded as one of the best driving routes you can experience. Something that many people might not associate with the Cabot Trail is the fact it is also one of the best destinations for your own safari. 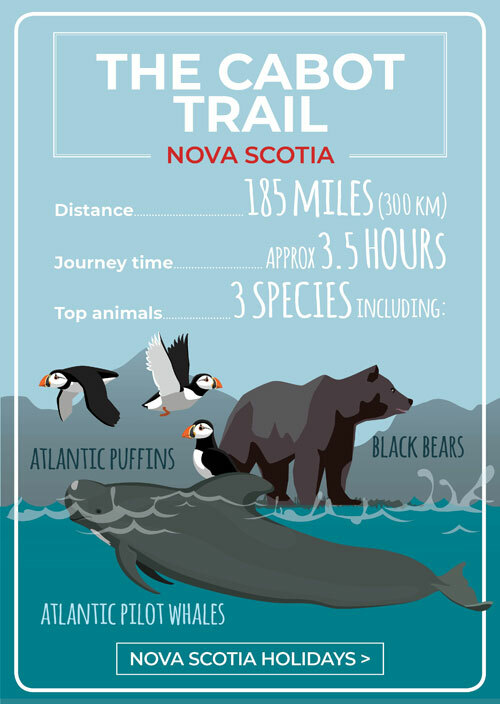 There is a wide assortment of wildlife you can see along the route and it is not unusual to see whales or Atlantic puffins in the Gulf of St. Lawrence from viewing decks along the trail. If you’re lucky, you might see black bears and bald eagles too. If you’re a keen hiker then you will be spoilt for choice as there are lots of scenic trails you can stop-off at and walk on. These include the Lone Shieling Trail at the base of North Mountain (a 15-minute walk) and the Skyline Trail which loops around part of the island. MUST READ: What are the top stops along the Cabot Trail? The Fjord Route (or Route du Fjord as it is also known) is another great destination to see animals in the wild. The route travels through a national park that is just teeming with wildlife, in a region with craggy mountains, rugged cliffs and dense forests. In Baie-Sainte-Catherine you might be able to spot a host of marine life including bluefin, minke and beluga whales as well as seals. The best time to go whale watching is from November to May. 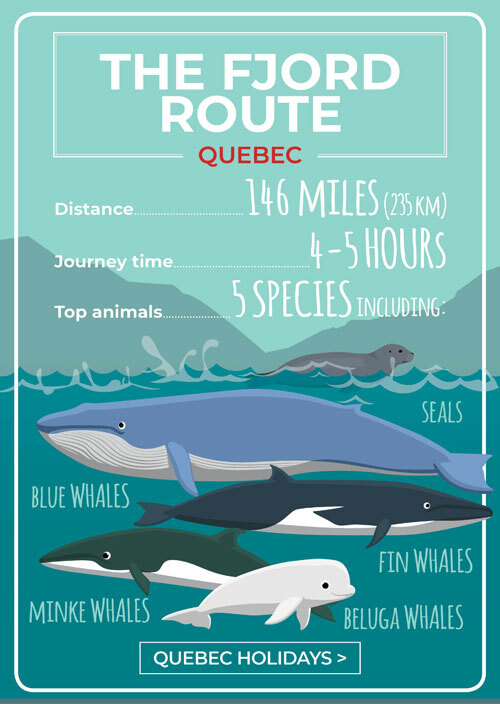 On top of the incredible wildlife, you can visit quirky and historic French-Canadian villages such as Petit-Saguenay and Rivière-Éternité. Any time of year is good to drive this four-season destination, but one thing to be aware of is that the area is not touristy and many restaurant menus along the route are in French only, so it might be worth brushing up on your French or bringing a pocket dictionary with you! What are the top tips for photographing wildlife? If you’re planning on hiring a car in Canada for your holiday and driving one of the aforementioned routes, you should follow some of these easy-to-apply tips and advice for photographing wildlife. “Research the location so that you make the most of opportunities to locate wildlife and the best times and places to photograph them. “Aim for simple backgrounds. The most compelling wildlife photos are often the ones where the subject stands out without any distraction. “Don’t be afraid to try something different. Aim for different viewpoints and composition. “Respect the wildlife and the natural environment. If you’ve been inspired to make future travel plans and experience Canada’s incredible wildlife in its natural habitat, then check out our Canada holiday packages. That dream Canadian holiday is just a few steps away.